Students, support the marking boycott! 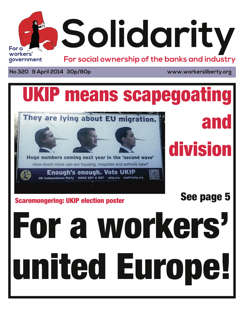 Against UKIP, for a workers' united Europe! Cinema workers at the Ritzy cinema in Brixton have announced 11 April as the date for the first strike in their dispute over pay. Members of BECTU at the cinema have conducted a long-running campaign to win the London Living Wage of £8.80 an hour. The typical hourly rate at the Ritzy is currently £7.24. Workers voted to strike by an 85% majority. Electricians working at a Network Rail construction site in Three Bridges, Sussex won new contracts following a wildcat strike on 4 April. Unite, Unison and GMB have initiated a ballot for Local Government workers with the recommendation to reject the derisory 1% pay increase offered by the Local Government Employers. The offer is in contrast to the current RPI rate of inflation of 2.8%. The cost of living for many of the lowest paid makes the offer unacceptable and pushes more workers further into poverty. The negotiations forced on London Underground bosses by Tube workers’ strike of 4-6 February will conclude on 14 April. Activists in the RMT union say the talks have been useful for learning more about the scale of bosses’ cuts plans, but that little progress has been made, management remain intransigent and workers must be prepared to strike again. Members of the University and College Union (UCU) will begin a boycott of marking on 28 April unless Higher Education bosses make concessions on pay. Higher Education workers have already struck six times against a 1% pay offer for 2013-2014. The boycott will be of all formal assessments. Delegates to the conference of the National Union of Teachers will meet in Brighton from 18-22 April just weeks after our national strike. Top of the agenda will be the national dispute with Michael Gove and, specifically, the next steps in the campaign of industrial action and public agitation. As at previous conferences the debate on the dispute will be shaped by a priority motion from the National Executive and amendments from delegates. There are at least three major issues to resolve. On 31st March, Ugandan president Yoweri Museveni was guest of honour at an inter-religious, ‘national thanksgiving rally’, held at the Kololo Independence Grounds in Kampala, to ‘celebrate’ the passing of the Anti-Homosexuality Act 2014. Other guest ‘celebrants’ at the event included Rebecca Kadaga, the speaker of the Ugandan Parliament; Stanley Ntagali, the Anglican Archbishop of Uganda; invited Catholic, Muslim, and Pentecostal religious leaders; sheikhs, senior pastors, bishops, and civil society leaders. Students are concerned about the ruling Parti Quebecois's cuts to public services, education and health while hiking the cost of hydro electricity. The demonstration was called by the Association pour une solidarité syndicale étudiante (ASSÉ), the militant student organisation which organised widespread student strikes in Quebec in 2012. A report on “target culture” in the police by the Metropolitan Police Federation has exposed the extent to the use of target-setting is failing victims of sexual violence and has inflated the use of racist stop and search powers. The Home Secretary Theresa May in considering letting police forces in England and Wales use water cannons against protestors. In January, Boris Johnson wrote to May in his capacity as the Mayor of London saying that he was “broadly convinced of the value of having water cannon available” in the capital. The Association of Chief Police Officers (Acpo) thinks “ongoing and potential future austerity measures” is an argument for arming police with water cannons.